Praise for all the family, this bumper DVD is a jumping, shouting, singing praise party to-go! 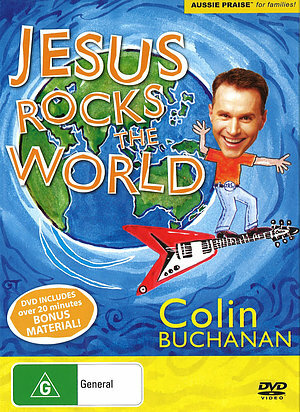 Colin Buchanan's JESUS ROCKS THE WORLD has become and instant favourite across Australia. Now this amazing album explodes onto DVD and video with all the colour, energy and fun that made 10,9,8... GOD IS GREAT a hit with kids of all ages. With an uncompromising heart for sharing Christian truth, Colin bounces, dances, and rocks his way through a new bunch of catchy memory verses and songs. With the help of Junkyard Jim, Fisherman Hamish McGibb, Ug the Caveman and a host of other pals, Colin teaches that lasting love, hope and glory are found in the sovereign Jesus alone. DVD Bonus features include "Behind the Scenes", "Dreaming Up The Video", a special "On the Road" video diary - plus a surprise or two! Jesus Rocks the World by Colin Buchanan was published by Authentic in September 2004 and is our 8976th best seller. The ISBN for Jesus Rocks the World is 9323078004789. Colin Buchanan manages to combine good Biblical teaching with lots of fun and excitement which helps young children to learn what it means to be a follower of Jesus. My 2-year-old daughter loves this DVD but older children enjoy the songs too. Love the Lord was a big hit at our summer holiday club this year. We have also sung Colin's song Jesus Saves, set to the tune of Jingle Bells, in church services. This is a fantastic song which gives the whole gospel story in three verses, set to a tune which everyone knows.